[The Fact] FAN N STAR has started distributing official tickets to the "The Fact Music Awards." New members as well as existing members can participate, and more than a thousand tickets will be presented to fans through various events. FAN N STAR closed their rating system and opened an official ticket event for "TMA." It also recruited SNS subscription events and promotional supporters to announce the massive distribution of tickets. The event is receiving an explosive response from fans as anyone can get an official ticket to "TMA" if they join FAN N STAR without any conditions attached. The 'TMA' official ticket event can be viewed once a day by turning the roulette to see if it has won. The right to apply can be obtained by completing a free star collection mission on a daily basis at FAN N STAR, If the rating is high, the probability of winning a prize increases. A thousand 'TMA' tickets will be distributed through official ticket events. The official ticket event will run until the 31st of this month. Supporters who promote FAN N STAR and "TMA" through their SNS are also recruiting. The recruitment date is due April 4. The selected supporters can promote "Fan & Star" and "TMA" on their SNS three times. If it's hard to promote, you can participate in the FAN N STAR SNS subscription event. 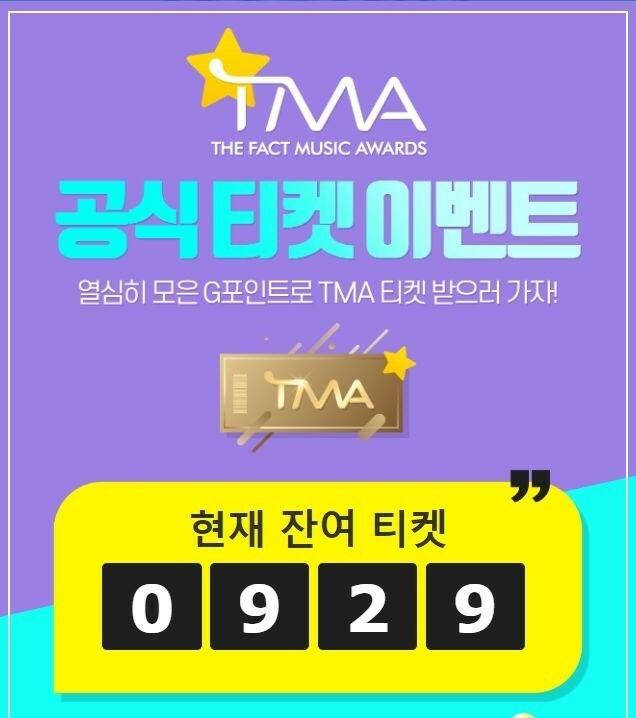 Tickets to the TMA will be awarded through a lottery for those who have taken out FAN N STAR Twitter, Facebook, Instagram, Naver Post, YouTube or The Fact Facebook. It will run until April 10. In particular, it is possible to participate in overlapping events between events, so if you actively engage in FAN N STAR, you can take a step closer to winning a ticket. FAN N STAR operate by ‘The Fact’ will host "The Fact Music Awards" and it will be held in Namdong Gymnasium in Incheon on April 24.